Cut the cucumber into ultra-thin slices (I use my food processor to get them paper thin). Toss cucumber slices with salt and let sit for 20 minutes. Drain well, squeezing gently to remove any excess water. Peel the carrots and shred (again, I use my food processor for this -- it makes it so much easier). In a large bowl, combine the cucumber slices, carrots, 2 tbsp seasoned rice vinegar, 1 tsp dark sesame oil and toasted sesame seeds. Toss well to combine. Set aside. Cook the rice vermacelli noodles according to package directions. Once cooked, rinse with cold water and let fully drain. In a large bowl, combine the rice noodles, 2 tbsp seasoned rice vinegar, 1 tsp dark sesame oil, ground ginger, garlic powder and soy sauce. Toss until fully coated. 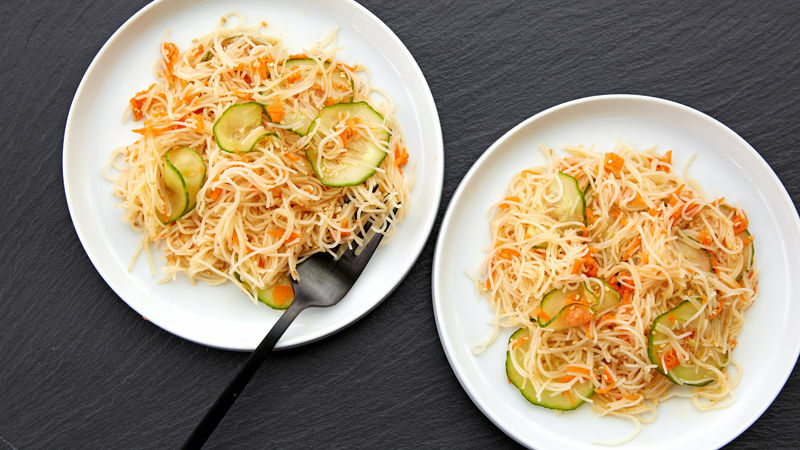 Divide the rice noodles among four plates and top with the cucumber and carrot salad. Serve.